Are fresh juice drinks as healthy as they seem? On these midsummer days, it’s hard to walk down the street without passing someone sipping a vividly colored beverage. According to food industry statistics, these folks aren’t likely to be drinking McDonald’s Shamrock Shakes or 7-Eleven Slurpees. Instead, people are shifting from sugary beverages with artificial ingredients to cold-pressed juices and smoothies. 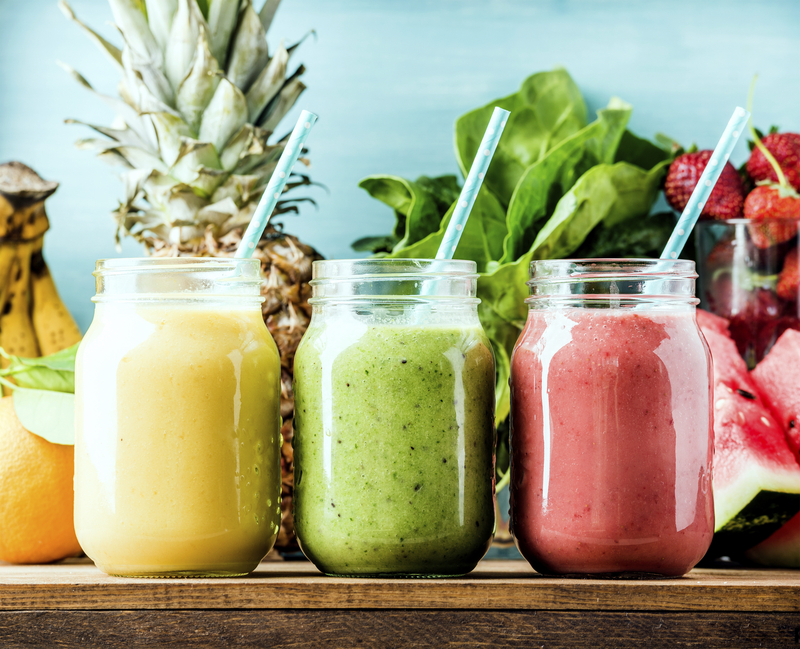 Sales of juice extractors and blenders lead the small-appliance market, and juice bars continue to spring up on city streets, in shopping malls, and even in supermarkets. Cold pressing employs the same principle as the hand-crank citrus juicer your mother or grandmother might have used: the fruits or vegetables are squeezed between two metal plates to extract the juice. Modern juice extractors may chop or grind the produce before applying hydraulic pressure to separate the juice from the pulp. The upsides: Because cold-pressed juices are usually served fresh, they retain more of a fruit’s or vegetable’s vitamins and minerals. They don’t have the added sugars or artificial sweeteners that most bottled juices contain. Additionally, when a glass of juice is squeezed from several fruits or vegetables, it is likely to have a wider array of nutrients per ounce than a single piece of fruit. The downsides: Juice has less fiber than a whole fruit or vegetable does, and fruit juices in particular are likely to have a higher glycemic index — a measure of how a food raises blood-sugar levels — than a whole fruit. Also, “there’s increasing evidence that drinking isn’t as satiating as eating whole foods,” says McManus. Studies indicate that people who drink juices tend to add them to their diets rather than substitute them for other foods, thus increasing their total calorie consumption. Smoothies are usually concoctions of several of the following: pureed fruits, pureed vegetables, juices, dairy products, almond milk, coconut milk, soy milk, herbs, and spices. The nutritional and calorie content of the beverage can vary widely according to the ingredients. The upsides: “Smoothies can be a good way of getting vegetables if you’re struggling to add them to your diet,” McManus says. If you aren’t crazy about leafy greens, blending them with berries or a ripe peach can disguise the taste of the vegetables. A smoothie can also provide a quick meal when you don’t have time to cook or even prepare a salad. For example, throwing a handful of spinach, a cup of blueberries, a couple of frozen strawberries, and a cup of nonfat plain Greek yogurt in the blender can deliver a healthy meal or snack in a minute. And smoothies have a nutritional advantage over juices — because the whole fruit or vegetable is used, they have more fiber and a lower glycemic index. The downsides: If you’re not careful, smoothies can pack in the calories. If you’re ordering a smoothie at a juice bar or restaurant, ask if it contains added sugar, syrup, or honey. If you’re blending your own, avoid fruit-flavored yogurts or frozen yogurts, which are likely to contain fruit syrups, added sugars, or artificial sweeteners. Use bananas, which have a high glycemic index, sparingly. Go lightly on the sweeteners; even “healthy” sweeteners like agave syrup and honey contain glucose. Smoothies and cold-pressed juices may provide healthy snacks and an efficient way to get vegetables. But be sure to include the calories they provide in your daily calorie allowance. For a lower-calorie alternative the Harvard T.H. Chan School or Public Health has developed recipes for fruit coolers and flavored water. Activity trackers: Can they really help you get fit? nice thought, thanks for your post.its really helpfull. Is there any evidence that these recent juice diets or juice plans support the claim made for weight loss, detox or cleansing? When man was in the original evolutionary environment, finding something sweet was a rare experience. My guess is that early man would gorge on fruits only from time to time. Preindustrial age fruits were quite different from current commercial versions. The impact of ingesting sweet fruit beverages unaccompanied by complete meals, is largely unknown. It is easier to recommend juicing vegetables daily for health benefits. Nevertheless, if the question is whether or not to shift from carbonated fast food sugar drinks to freshly made fruit juices or smoothies, the choice is easy — go for the fresh juices with pleasure. As a registered dietitian working with the Juice Products Association, I believe it is important to point out that 100% fruit juice contains the same beneficial nutrients as whole fruit, including vitamin C, folate, potassium and other beneficial plant compounds with no added sugar. This is why the 2015-2020 Dietary Guidelines for Americans continue to recognize juice as a nutrient equivalent of fruit. Therefore, if you are looking to make healthy choices, there is no reason to eliminate fruit juice from your diet. Studies demonstrate that people who drink 100% juice have higher quality diets, eat more whole fruit, and have either comparable or higher total dietary fiber in their diets as well as lower intakes of saturated fat, total fat, sodium and added sugar than non-juice drinkers. This research suggests that 100% juice complements rather than competes with whole fruit. The article should certainly have addressed the fact the sugar in juices and pulverized fruit is absorbed very rapidly in the blood. I have never been a fan of smoothies because I believe their fiber content is less than the fruit used to make them. I would like to have information on the fiber content of fruit, smoothies, and juice. For example an apple has x grams of fiber. To get an equivalent amount of fiber from apples in a smoothie you need to use x number of apples. Smothies of whole fruits do not loose their content of fiber. Besides, phytochemicales are released more effectively. I have certain food intolerances and I therefore digest juices much better than many fresh fruits, and vegetables. The former also give me a glowing complexion. As for smoothies, I use almond milk (40 cals a cup), and find those more digestible as well, as too much fibre ia a stomach irritant. And, since the digestive process starts in the mouth where we are encouraged to chew each mouthful a minimum of 20 times, what does just plopping all this un-chewed food into the stomach do to the food and the digestive organs? The article would have been more notable had it actually given data on the amount of sugar and other undesirable ingredients that say an 8 oz cup of orange or tomato juice contains and how that compares with the recommended daily allowance.